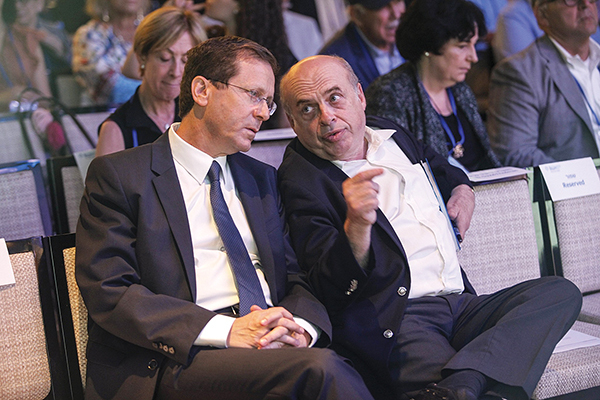 Isaac Herzog, left, the new chairman for the Jewish Agency, with outgoing chairman Natan Sharansky. JULY 5, 2018, JERUSALEM – Israeli Jews and Jews abroad are at odds, whether it’s about Donald Trump or matters of religion and state. Just last week, Diaspora Jewry seemed to have this in mind when it handed Prime Minister Benjamin Netanyahu a stinging defeat in choosing a new chairman for the Jewish Agency. For those who are unfamiliar with the organization (a lot of Israelis would be hard-pressed to tell you exactly what it does these days), it was the governing body of the pre-state Palestinian Jewish community. Once the British were gone and there was a state led by a government and a Knesset, its chief job was to oversee the ingathering of the exiles – which in the country’s first wobbly and austere decades was a major and dead-serious endeavor. More recently, with aliyah nothing like it used to be and a government ministry firmly in charge of immigrant absorption, the Jewish Agency became Israel’s bridge to the Diaspora – pushing aliyah, but more importantly seeking to keep the spark of Zionism (not to mention Judaism) alive out there with emissaries and programming, both locally based and in Israel. This is important work, of course, but it has nothing of the budget it used to and has become a landing place for Israeli politicians who conclude that they have no chance of becoming prime minister. The outgoing chairman is Natan Sharansky, perhaps the most famous refusenik and one of the most admired and respected Jews in the world. In the 1990s, he formed a party targeting the estimated 1 million people who arrived in Israel from the former Soviet Union after the fall of communism. The party surged, foundered and then merged with the Likud, where he was quickly marginalized by far more aggressive pols. He left politics, and 10 years ago he was elected head of the Jewish Agency, acceptable to both Netanyahu and the agency’s Board of Governors, which – and this is important – is heavily weighted in favor of Diaspora Jews. At the end of 2012, Netanyahu asked Sharansky to lead efforts to find a way to make non-Orthodox Jews, on the one hand, and Orthodox and ultra-Orthodox Jews, on the other, happy at the Western Wall, which since 1967 has become the equivalent of an Orthodox synagogue, most notably with gender separation. The problem is that the majority of Diaspora Jews are not Orthodox but maintain a special place in their hearts for the Wall. The Orthodox and ultra-Orthodox in Israel, though, control the Wall and are kingmakers in the country’s politics. The committee that emerged came up with a plan to make the southernmost part of the Wall – which many would never even think of as the “Western Wall” owing to an interruption by a ramp leading up to the Temple Mount – a place for pluralistic prayer. What’s more, the area would be overseen by a committee to include representatives of the local branches of Reform and Conservative Judaism, as well as members of Women of the Wall, a group that has been agitating for women’s rights at the site for the past three decades. The plan was acceptable to almost all pluralistic Jews save for the most militant, who insisted that the rules for the main part of the Wall be changed rather than agreeing to a space that would literally keep them out of sight. Tellingly, the leaders of Israel’s ultra-Orthodox parties seemed to have no problem with it, and a government decision to implement the plan was announced to great fanfare in January 2016. Then things went south. The constituencies of the religious parties, for years turning more and more extreme, let their representatives know how they felt. They said that giving in at the Wall would lead to compromises in other areas of religion and state, such as conversion laws and control over marriage and divorce. The fears were heightened by statements from non-Orthodox streams claiming that the deal was tantamount to their recognition in Israel, where all religious matters are controlled by the very territorial Orthodox. The whole thing left a bad taste in the collective mouth of progressive Jewry, especially non-Orthodox Zionists in the Diaspora who took it to mean that they weren’t at all important in the eyes of a man who thinks of himself as leader of the world’s Jews. Even Sharansky was disgusted, so with his term as chairman coming to a close, it was time for payback: the Jewish Agency nominating committee ignored Netanyahu’s candidate, Yuval Steinitz, a lackluster member of the Likud whose political days are likely numbered, and instead turned to Knesset opposition leader Isaac Herzog. Only twice since 1977 and the end of 29 straight years of Labor rule has Herzog’s party been able to take back the reins of power on its own (meaning without a unity government). Both times the party was led by security hawks: Yitzhak Rabin and Ehud Barak, former combat soldiers and IDF chiefs of staff. This is probably because many voters who are amenable to major concessions for peace can sleep better knowing there is someone at the helm who can be tough when times warrant it. Herzog comes from an illustrious family. Although himself secular, his grandfather was the first Ashkenazi chief rabbi of the State of Israel. His father was an Israeli general, politician, diplomat and finally president. But Isaac himself can only boast of a desk job in the IDF as a mid-level intelligence officer. He has a whiny, nasal voice and milquetoast looks that don’t exactly instill a sense of physical security. He also has no more charisma than Steinitz, and some of his critics have likened him in more ways than one to a chicken. Having been defeated as party leader just under a year ago by an insurgent with absolutely no Labor past, yet able to retain his post as the official leader of the opposition due to a Knesset technicality, Herzog was the perfect candidate for Diaspora Jewish leaders who were deeply unhappy with Netanyahu, and the Jewish Agency’s Board of Governors was unanimous in electing him chairman. It was the first time in anyone’s memory that the body went against the express wishes of a sitting Israeli prime minister. Sharansky made similar statements during his tenure. The importance now lay not so much in the words but in the fact that the stage had been given to Herzog to say them. So instead of looking at the Jewish Agency as a place where political has-beens are put out to pasture, a similar metaphor can be used: it’s where chickens come home to roost. Let’s wait and see where a member of the political opposition can take it in these days of Diaspora dissatisfaction with Israel’s leadership. But none of us should forget that the Jewish Agency is the last ecumenical bridge between Israel and Diaspora Jews, and this bridge should never be burned.